Wondering what your next move might be? 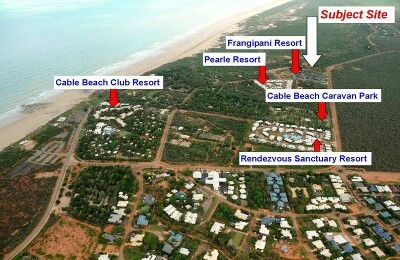 Why not capitalise on this elevated 10,069sqm zoned tourism lot located in very popular Cable Beach. With eco style resort development approved compliant with building codes plus full financial feasibility and business research available this could be ideal for you. Features: -10,069sqm zoned "Tourism" -Existing council approval & development -Eco style resort compliant with building codes -Power, water, sewer, bore & drainage swale -Mature canopy of trees & new plantings -Full financial feasibility study conducted -All business modelling & research available This development site is considerably elevated providing a sensational night time view of Broome with it's fairyland of lights and vast daytime view sweeping across Cable Beach. Please call Allan Griffiths at First National Real Estate Broome on 0419 922 000.